In my experience I find that most uses of QR codes aren’t very effective uses of the technology, in fact many are flat out bad. A plurality are just ‘ok’, and only a few are great. This is a blog about a great one. This particular use of QR codes was not one I found myself, so I am not sure when it occurred, or if the campaign is still going on, but this QR code campaign is what people should use as an example of how to use the technology. So props to First Bank. What First Bank did was run an advertisement in an airport with a tag line saying “We’re here to help you save.” The focus of the ad though was three large QR codes. 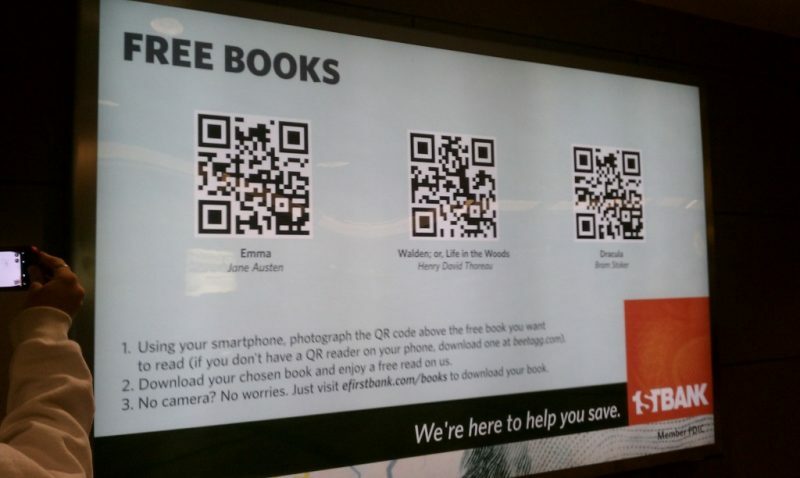 Each QR code could then be scanned by your phone or tablet to download a free book to your device, with your choice of classics: “Emma” by Jane Austen, “Walden; or, Life in the Woods” by Thoreau, or “Dracula” by Bram Stoker. 1) It is giving away something free to anyone who wants it, this alone is a great way to entice people to scan the code and interact with your brand. 2) It provides a good at the ideal time when someone might be in the market for what they are offering. In this case people waiting for their plane are likely to need reading material, and a free book is the perfect thing to offer in such a location. 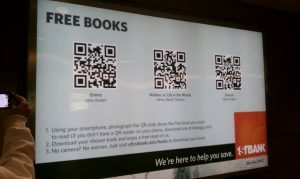 3) The ad places the focus on the QR code and gives a perfect easily understood call to action “FREE BOOKS”, and clearly explains how to take advantage of the codes and what you get for whichever code you decide to scan. 4) They fit the codes purpose, that of giving away free e-books, into their tag line “We’re here to help you save.” A very creative idea. 5) Lastly, having it placed in the airport where there is a lot of foot traffic, and creating an advertisement that requires interaction easily sparks interest by other passersby’s when they see someone stopping to scan the codes. Humans are generally followers, so this type of ad in this type of setting can easily help spread interest in the ad and drive an even greater number of scans. 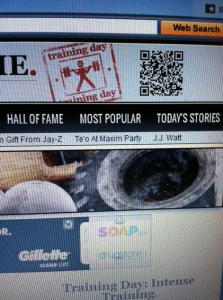 The only problem I see in this ad is the lack of Mark Twain books and essays. Other than that this it is a perfect use of QR codes and a great example of how to use the technology in similar ways for your own particular business or brand. For more information on QR code best practices go HERE, and to learn more about the easy to use QR code/mobile website Platform click HERE. I was traveling through western Massachusetts a couple weeks back and had to stop by a local mall in the Berkshire’s for a meeting with a customer. I walked in and what did I see but a large sign emphasizing a QR code. My day was made. The first thing I will say about this particular use of a QR code is that they are really using the code well by making it the focal point of their advertisement. 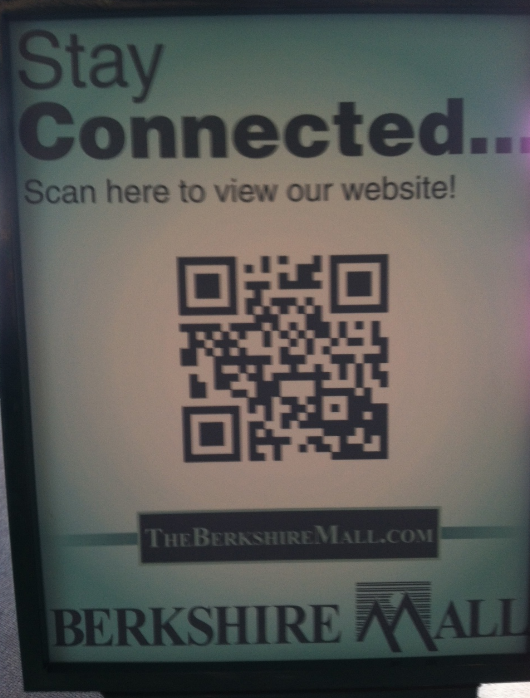 But of course they don’t want people to just scan the code for its own sake, but instead to direct customers to their Berkshire Mall website/blog. When you use a QR code you should always have an actual purpose, rather than using a QR code just to use one. Whether this purpose is to drive traffic to your website or blog as we see here, or to drive sales or provide information, it does not matter, so long as there is a benefit to you or your customer. When you use a QR code it is vital that there be a call to action to convince someone to scan the code. In this case they used a call to action, so in that regards they did well. But the call to action is weak and doesn’t make anyone go out of their way to scan the code. Simply saying “scan here to view our website!” isn’t all that enticing. Instead, the call to action should give a reason to scan the code. For example in this case, they could have said something like “scan to see our current sales!” or some other call to action to provide a good reason to scan the code. Once I scanned the code I was taken to their website/blog, and here I noticed a couple of things. First, I saw that it was really a blog about the happenings at the mall; what deals were going on, where the sales were, and whatever other important events were coming up. From this I began to wonder why they didn’t use that in their call to action, since they probably would have had many more people scanning the code if they knew what they would get out of it. The next thing I noticed, and a common problem I see with most QR code users, is that their website was a desktop site and not mobile optimized. 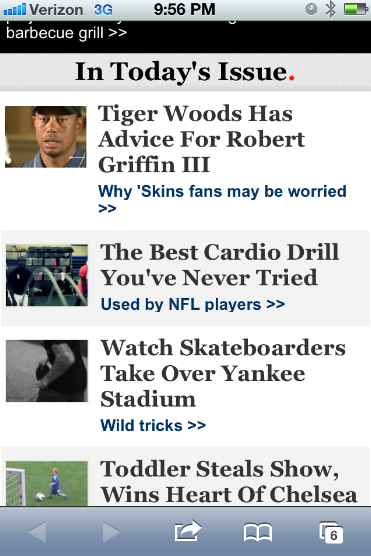 This makes using the site very cumbersome and hard to navigate. 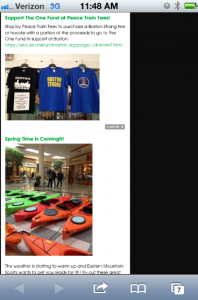 Because the desktop site’s main purpose was as a blog, disseminating information about the mall, there is a lot of writing, which makes it ideally awful for reading on a mobile phone. If you are going to use a QR code you must create a mobile optimized website or you probably shouldn’t even be using a QR code. You might think this is a big expense, but if you use the correct QR code platform, this can cost almost nothing to create, and will ensure your QR code campaign is actually usable. 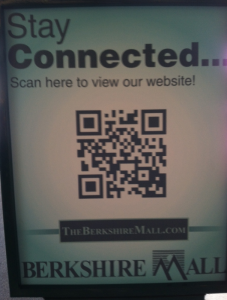 This particular QR code use makes sense for the mall since it is a great way to provide the thousands of smartphone wielding shoppers with relevant information and help the stores in the mall attract customers. A win-win for all parties involved. When you decide to use QR codes in your marketing or advertising campaign it is vital that you follow certain best practices, but beyond that you must make sure you do those things well. Use a QR code, but make it stand out. Have a call to action, but make sure it is enticing. Have a mobile optimized site, but make sure it looks good and gives the customer what they want. Using a QR code can be incredibly valuable, but it isn’t just some throw on tool. It takes thought, time, and creativity to use this tool well. A QR code is only as good as the people directing it, so make sure you know how to get the best out of them before you start throwing them on all of your marketing and advertising materials. Most of the time we focus on how QR codes can help a business’ marketing and advertising, or how they can provide additional value to customers and increase customer loyalty, rarely do we cover how QR codes can be used in non-business ways. That stops now. QR codes, and specifically the Qfuse platform, have been used to great affect at the annual Framingham Memorial Day Soccer Classic. The tournament includes over 110 teams, playing at various locations with thousands of players, referees, families and friends in attendance. You can certainly expect that for such huge tournament there might be some logistical problems for all of those involved. Indeed, for these people in attendance, trying to keep track of the schedules, the fields each game is on, finding directions to the various locations, and important local facilities, is a tough feat. In order to help solve these problems the man in charge of the tournament, Scott Vermilya, decided to use Qfuse and QR codes to solve this potential logistical problem. What he did was place a QR code on signs around the tournament locations that upon scanning directed the person to a mobile optimized page with all the tournament info you could possible need. This included the schedule for every team in the tournament, where each game was being held, directions to all of the facilities, and even a map to the nearest hospital (which came in handy for one family at last year’s tournament). Using the QR codes allowed everyone to scan the code and have access to all of the tournament information at their finger tips for the entire weekend. Scan the code once and keep it open in your browser and you don’t need to scan it again. Close your browser and access it again at any time by scanning one of the many codes posted around the tournament grounds. This use of QR codes and the Qfuse platform meant that far fewer trees needed to be chopped down and turned into thick soccer schedules, and the information could be easily accessed by all those involved, and unlike a paper booklet, the information on the mobile site could be updated in real time to show game results, changing schedules, or re-locations. 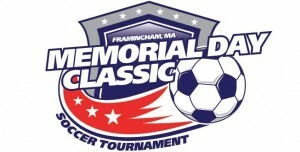 What Mr. Vermilya and the Framingham Memorial Day Soccer Classic show us is that QR codes, if used correctly, can be a fantastic resource for these sort of large events, whether its sporting events, concerts, or what have you, the uses are endless and the benefits are great. And like Mr. Vermilya experienced, Qfuse makes the process easy and professional. 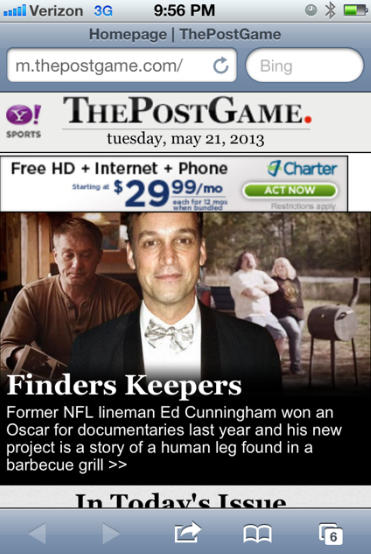 To read more about this particular use be sure to check out this recent article in the Boston Globe. 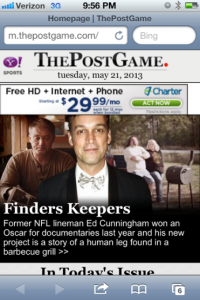 Putting QR Codes on Desktop Websites: A Bad Idea or a Terrible idea? So I have written before about using QR codes in TV commercials and other media, but I don’t believe I have ever discussed using QR codes on desktop websites, or other online uses. The main reason for this lack of discussion is that I have never been lucky enough to see such a terrible use of a QR code myself. Maybe I am jumping the gun though in calling it a terrible use. To be honest I haven’t given it a ton of thought. But now is a perfect time to dwell on the issue and determine if it’s only a bad use or if it really is a terrible use of a QR code. So I was on Yahoo!sports.com and saw an article about getting chiseled abs and couldn’t resist finding out about the one easy move I needed to melt away all my fat from my gut. I clicked the link to the article and the resulting screen that was staring back at me was baffling and prevented me from ever making it to my main purpose for visiting the site: to become a chick magnet. The problem was the confusing QR code that sat in the top corner of the webpage. I glared at it for a good minute wondering what I was seeing. Finally I realized that it indeed was a QR code, and someone somewhere decided it would be a good idea to place the code on a desktop ad. A Yahoo!Sports.com blog called The Post Game. The blog was optimized for mobile phones, indicating that indeed someone somewhere really put some thought into this QR code campaign, and expected it to actually be used. The question that needs to be asked at this point is why not just link to the desktop blog since clearly I am already using my desktop computer? Now of course you probably could have clicked on the headline and would have been taken to that exact blog, but why add the QR code? The only possible answer I can come to is “Why not?” And surprisingly I may actually find some merit in such a response. At first I found this QR code use simply ridiculous and quite useless, but after giving it a bit more thought I wasn’t so sure. If you have a large banner ad like this one, and you have some empty space, throwing a QR code on there may not be a bad idea (a call to action or a description as to what it is would certainly help though). Here is a hypothetical as to where it could be useful: Suppose you are quickly browsing Yahoo!Sports.com on your desktop to consume your opiate for the day but you need to get going. There is some incredibly important article about Lebron’s ego having its own Birthday celebration that you are unable to get to and wish you could read it later in the day. You all of a sudden see a QR code telling you to “Take our blog with you! Scan the code!” You scan the code and now you have access to Lebron’s ego right there on your phone, ready to be read at a later time! So we see that such a use of QR codes isn’t entirely useless. In fact, after even more thought, I can see QR codes on desktop sites being VERY useful. Say you are a company that wants to advertise your new mobile app, why not place a QR code on your desktop website telling people to scan the code to be directed to your new mobile app! BAM! More App downloads! Really it is quite genius. I don’t know how I hadn’t thought of it before. Start using the Qfuse platform and start seeing app downloads come streaming in. One of the many great ways to use QR codes is in a retail business setting. In such a setting QR codes can be used in an incredible variety of ways, either from the perspective of a single retail product producer, or the retail business owner. From the perspective of the retail business owner using a QR code to provide additional value or deals to their customer is a great choice, for example providing coupons by scanning a code and having the customer provide their email address. Another way a business owner might help the consumer, and even help reduce staff or provide additional tools to staff, is to use QR codes to provide additional information to customers. To illustrate what I mean let’s look at a recent pet store I stopped in at. 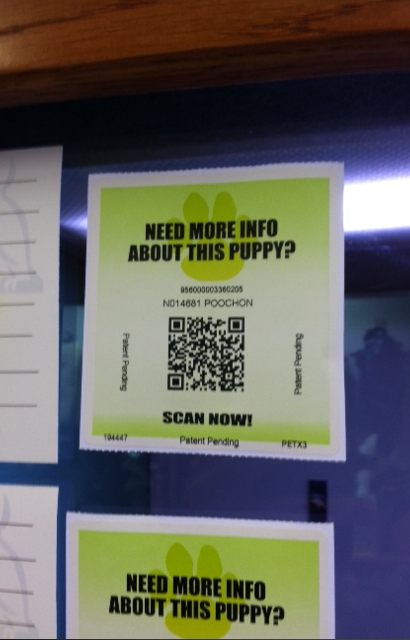 This pet store had QR codes posted on the windows of each cage. 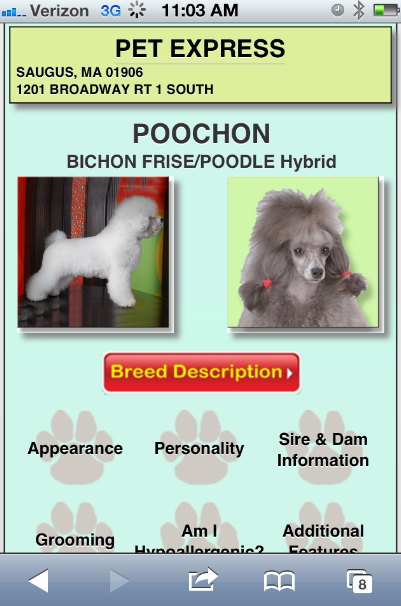 The QR code had a solid call to action, telling the consumer to scan the code if they want more information on the particular cat or dog. Upon scanning the code they were taken to a mobile optimized website, though slightly outdated looking (not sure how you manage that with a mobile website). The landing page provides answers to almost any question you might have about the animal and other information, including: appearance, personality, grooming, and a ton more information on other topics that I personally know little about. This great use of a QR code helps the customer access information even if the store employee is busy, or perhaps helps reduce the need for employees, thus helping to reduce overhead costs for the store. For the employee, assuming he/she is still needed, can also access this information in times that he/she may not know an answer. They can simply scan the code and find the answer to a customer’s question. A very handy tool for employees in most retail settings. This type of QR code use can be used in any situation where a product might be complicated, very technical, or where customers often ask a ton of questions. This might mean using QR codes to explain electronics, outdoor gear, footwear, or whatever. As a retail store owner it is vital to stay ahead of the game and think outside the box, particularly with internet sales continuing to take market share. It is vitally important to provide additional value and information to customers to keep them coming back to the store, rather than going online or even to another physical retail location. QR codes are easy, smart, and inexpensive, just make sure you use a platform that meets all of your needs and is easy to use. Hmmm, that seems to explain Qfuse! So give it a shot.